At times it is desirable to have independent variables in the model that are qualitative rather than quantitative. This is easily handled in a regression framework. 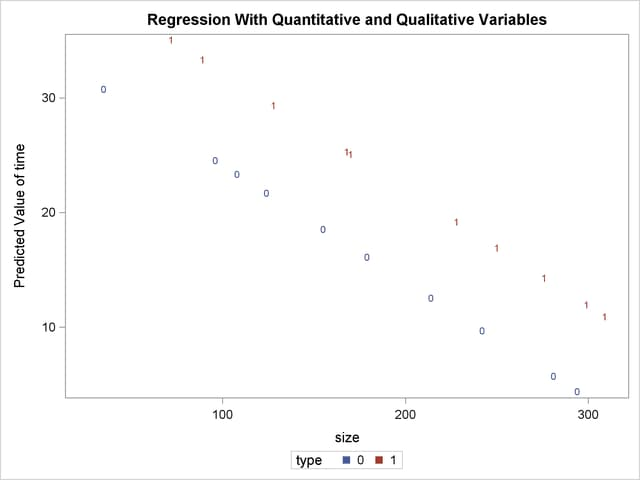 Regression uses qualitative variables to distinguish between populations. There are two main advantages of fitting both populations in one model. You gain the ability to test for different slopes or intercepts in the populations, and more degrees of freedom are available for the analysis. 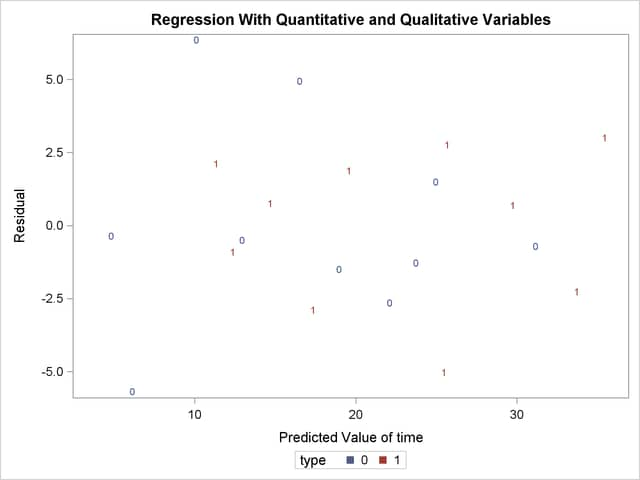 Regression with qualitative variables is different from analysis of variance and analysis of covariance. Analysis of variance uses qualitative independent variables only. Analysis of covariance uses quantitative variables in addition to the qualitative variables in order to account for correlation in the data and reduce MSE; however, the quantitative variables are not of primary interest and merely improve the precision of the analysis. for the observations . The parameters to be estimated are , , , and . The number of dummy variables used is one less than the number of qualitative levels. This yields a nonsingular matrix. See Chapter 10 of Neter, Wasserman, and Kutner (1990) for more details. An example from Neter, Wasserman, and Kutner (1990) follows. An economist is investigating the relationship between the size of an insurance firm and the speed at which it implements new insurance innovations. He believes that the type of firm might affect this relationship and suspects that there might be some interaction between the size and type of firm. The dummy variable in the model enables the two firms to have different intercepts. The interaction term enables the firms to have different slopes as well. In this study, is the number of months from the time the first firm implemented the innovation to the time it was implemented by the th firm. The variable is the size of the firm, measured in total assets of the firm. The variable denotes the firm type; it is 0 if the firm is a mutual fund company and 1 if the firm is a stock company. The dummy variable enables each firm type to have a different intercept and slope. This model has intercept and slope . The data1 follow. Note that the interaction term is created in the DATA step since polynomial effects such as size*type are not allowed in the MODEL statement in the REG procedure. The ANOVA table is displayed in Output 76.4.1. The DELETE statement removes the interaction term (sizetype) from the model. The new ANOVA and parameter estimates tables are shown in Output 76.4.2. The overall statistic is still significant ( =72.497, <0.0001). The intercept and the coefficients associated with size and type are significantly different from zero ( =18.675, <0.0001; = 11.443, <0.0001; =5.521, <0.0001, respectively). Notice that the did not change with the omission of the interaction term. So the two models have different intercepts but the same slope. The following statements first use an OUTPUT statement to save the residuals and predicted values from the new model in the OUT= data set. Next PROC SGPLOT is used to produce Output 76.4.3, which plots residuals versus predicted values. The firm type is used as the plot symbol; this can be useful in determining if the firm types have different residual patterns. The residuals show no major trend. Neither firm type by itself shows a trend either. This indicates that the model is satisfactory. The different intercepts are very evident in this plot. From Neter, J., et al., Applied Linear Statistical Models, Third Edition, Copyright (c) 1990, Richard D. Irwin. Reprinted with permission of The McGraw-Hill Companies.